I am a professor in the Earth and Planetary Sciences department. My research interests include the geobiology of extreme environments, compound-specific isotope organic geochemistry, Neoproterozoic chemical evolution of the ocean-atmosphere system during extreme isotope excursions, and carbonate sedimentology, stratigraphy, and geochemistry with an emphasis on microbialite preservation and morphology. ​As faculty advisor I provide guidance to the club’s leadership and interface with university leadership and landowners. I'm a grad student in the Earth and Planetary Sciences department studying the geobiology of the continental deep subsurface. I am currently exploring microbial communities at the Deep Mine Microbial Observatory (DeMMO) at the Sanford Underground Research Facility, focusing on microbe-mineral interactions and lipid biomarkers, as well isolation of novel organisms through field and lab cultivation experiments. As Geoclub parliamentarian, I play a largely organizational role to help coordinate club ongoings and bring members together for meetings. On my days off you can catch me playing my favorite 80's tunes on my synth, obsessively drinking coffee and writing code, or entertaining my two cats Creme Fraiche and Neko. I am a Ph.D. student in the Earth and Planetary Sciences department, where I study large earthquake temporal clusters from a probabilistic perspective. My research proposes an alternative to the traditional earthquake cycle model that allows a fault's past to influence its future likelihood of experiencing an earthquake. Additionally, my research looks at qualitative intensity distributions from large historical earthquakes in California, which can facilitate a better understanding of how well current probabilistic seismic hazard assessments reflect the observed record of earthquake intensities and damage. As Geoclub treasurer, I oversee the club's budget and allocate funds to cover club expenses. When not at school, you can find me on my yoga mat or walking my dog along the shores of Lake Michigan. I am a graduate student in the department of Earth and Planetary Sciences at Northwestern University. As swag czar for NU Geoclub, I organize the design of club logos and promotional materials. My research explores climate change in the Arctic through geologic records (primarily through the study of lake sediments) and through remote sensing. Lacustrine sediment cores from glacial threshold lakes, as well as satellite images and air photos are utilized to reconstruct the recent climate history of southern Greenland, including fluctuations in the extent of alpine glaciers. These records allow for empirical observations of how natural systems respond to a changing climate, and through these past responses, we may better estimate future change in the polar regions. In addition to research, I committed to communicating science to a broader audience through outreach events and involvement with local schools. In my free time you can find me needle felting miniature animal heads or oil painting. I really like plants, cats, and rocks. I am a postdoctoral researcher working with the Professor Yarrow Axford in the Earth and Planetary Sciences Department. I am a terrestrial paleoecologist, specializing in reconstructions of high-latitude climatic variability and disturbance regimes during the Late Quaternary. 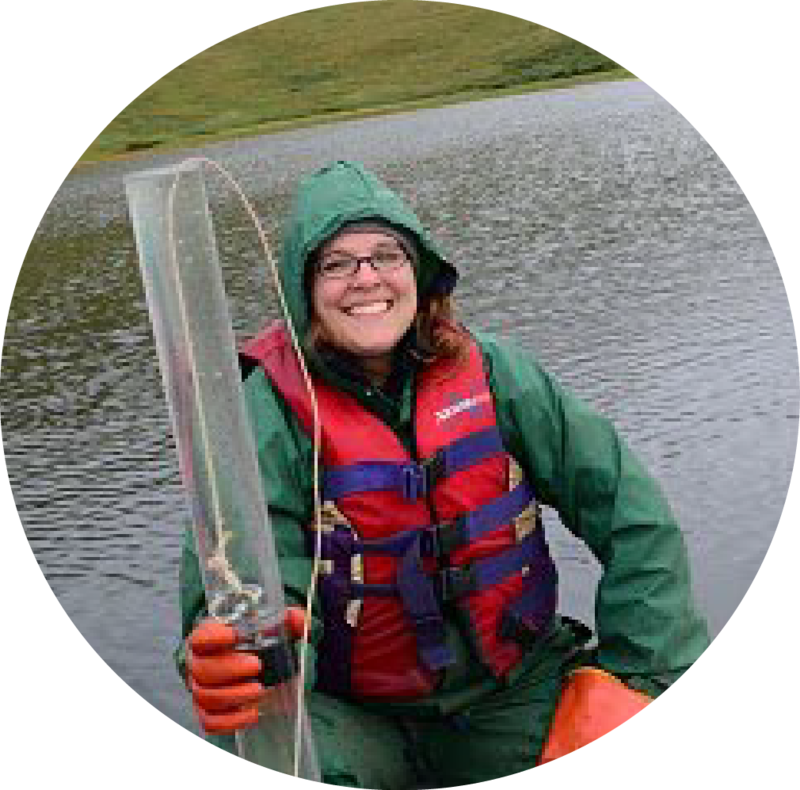 I use biological and geochemical indicators from lake sediments to reconstruct fire, permafrost thaw, and summer air temperatures, providing valuable baseline information to better understand the role that Arctic ecosystems may play in a warming world. My previous field sites are located throughout Alaska, and I am traveling to southern Greenland next summer on a new mud-collecting adventure. As the GeoClub Seminar coordinator, I am the person to contact if you are interested in giving a practice talk at our weekly colloquium. As a regular human, I enjoy telling stories about growing up in the Appalachians, sharing perspectives with other first-generation students, and writing poetry. Hello! My name is Annie, and I first became interested in earth science through my passion for outdoor adventure. Years spent working as a rock climbing guide in the Columbia River Gorge, a backpacking guide in the Colorado rockies and a mountaineering guide in the cascades fueled a curiosity towards earth science that led me here, where I am a second year PhD student. I study basalt chemical weathering and its affects on the long term carbon cycle. To put it simply, when basaltic rock dissolves, it releases elements into rivers that bond with atmospheric CO2 and remove it from the air, cooling off the earth. By analyzing river chemistry in Icelandic rivers, I hope to calculate how fast the rock is dissolving, and thus how much CO2 is being removed from the atmosphere by this process currently. This summer, I spent two months in the mountains of Iceland collecting over 1200 pounds of water and rock samples! When I'm not in the lab, Im usually mountain biking down at Palos Hills or hopping on a plane to go ski in Utah! Im jazzed to bring my excitement for the outdoors into my role as the Field Czar for the Geoclub. I'm an undergrad studying environmental science, earth science, and music performance. As NU Geoclub’s communications director, I assist with outreach efforts, help communicate information about the club to both members and non-members, and coordinate with the swag czar to distribute promotional materials. I am research-active in the earth science department. Since spring of 2016 I have been working toward my senior thesis, which will discuss calibrating commonly used paleoclimate proxies for more accurate use in high-latitude environments, particularly Greenland. I’m excited to continue delving deeper into earth science my senior year here and into graduate school, through course work, lab work, field work, and recreation alike. I’m motivated by my love for the earth, my eagerness to learn, and my belief that climate data should be better communicated between scientists, politicians, and the public. As a dual-degree science and music student, my free time is not always abundant, but in it I love to go swing and blues dancing. I am a Senior double majoring in Environmental Sciences and Earth and Planetary Sciences. I love modern applications of organic geochemistry, in particular how chemical histories can inform us about changes in a system. My current research uses biomarker analyses to investigate how industrialized agricultural practices augment organic inputs to lake sediments. As Service Chair, I hope to organize club members for restoring local ecosystems, protecting natural resources, and other activities that help us maintain and appreciate our small slice of the globe. Outside of the lab, I can be found slacklining or playing beach volleyball. I am a senior majoring in Earth and Planetary sciences. Within the department I am currently working on projects communicating the process of predicting the probability of earthquake occurrences to a non-expert audience as well as participating in ongoing research interpreting seismic reflection profiles of Lake Superior to describe mid-continent rift tectonic processes. As undergrad parliamentarian I help coordinate field trips, events, and recruitment. Outside of rock related activities I also write satire and box.